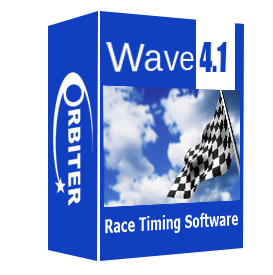 Purchase a Perpetual License of the Wave RFID race timing software , Contact Orbiter at [email protected] Email for a free Download Demo. To keep participant enthusiasm, Event Organizers constantly adapt and make new exciting variation of event themes. To meet this need, Orbiter Wave (TM) Timing & Scoring software was designed to be the most versatile timing software in the world. Wave is optimized to time events like Triathlons, Team Relays with Wave, Scheduled, Individual, Interval, and Gate Starts. Wave is also able to time and count amazing combinations of events. Nothing is too difficult. Bike, Obstacle Courses, Mud Runs, Swim, Paddle Board, you name it. Even “Path” events. An example of a Path event is placing Orbiters all over a ski area and having skiers ski past in any order. Winning the event with the most efficient route. Starting the event from any Orbiter. This means starting the event from any position yet finishing the event in the same place. No other timer can do this in the world today. Live results shown on cell phone and a large LED at the Lodge. Only Orbiter can do this in the world today. Party on! Our software uses the most advanced database and can handle worldwide events of terabytes in size. The Orbiter database has been independently measured at three times the speed of most other SQL databases. Our programmers operate super computers and know how to slice and dice data like no other. We are world experts at real time data communication for events, governments and militaries. Wave features: Provides the greatest side antenna Timing detection control in the World. Users report the most accurate timing with “on” the line confirmation in real time – no latency like other systems that take 7 seconds to confirm a tag detect. Last Tag Detect is used for Bike Races, Triathlon Transitions, and other unique events. No other company has last tag detect that is automated at the reader level like Orbiter. Our embedded reader software truly makes the Orbiter detector smart like a robot. When a tag is presented the reader makes independent logical decisions based on “Gestation Period”, “Decay Period”, and “Phased Detect” technologies. Only Orbiter has this know how and why we have and license over 140 issued Patents. * Individual control of each detector from your tablet or laptop. A must for easy and quick Triathlon timing. The Orbiter technology makes timing races so easy even novice first time users time the most difficult races flawlessly. * Unlimited split timed tag detects. Ideal for proof of world record holder attempts, when lap counting is required. * Ability to move detectors easily and configure on the fly. (Leap frog detectors to save on costs). * Triathlons: multiple detector configurations. Flexible with 3 minute set up. Ideal for set up time restrictions at Parks in the early AM. * Know where the tag detects came from on a Triathlon instantly, so official results are just a button click away. * Wave Starts, the safety of automatic check in so you know 100% who is in and out of the water. Prevents a person jumps into a wave to be with a friend. * Team Relay with Virtual Baton. Allows knowing who is on a track and their on track split times as team member’s trade back and forth. * Pre-designed Jasper Reports or easy custom reports that look great. Excel reporting for on the fly. Color too. * PDF and Spreadsheet output with output of all data to provide the level of detail desired for advanced users. * Flexible Triathlon Transition Box set up. One Transition area or two Transition areas in in one location or different locations. * Optional: Connect to LED Displays, and output results instantly to participants that walk up for all to see. * Tweet results to participants and avoid third party charged for SMS text. * Set up your own private WI-FI local broad cast station. Runners can view instant results on their cell phones where there is no cellular service. * Cellular Marathon Split Times that track participants without the need of mats. Deployed as fast as pulling them out. * 24 / 7 / 365 day of the year running systems for Parks and Resorts. 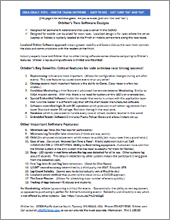 * Flexible tag assignments so that one or more tags may be assigned to the same participant. * Replace lost tags on the fly and retain past data associated to the new tag instantly. * Camera, Video, and other connectivity. * Photo Finish Lynx compatibility. Jasper Reports allows professional rich color custom reports. Easy connectivity to each RFID detector. Just turn the detectors “On” Cellular, Satellite, WI-FI, VHF connectivity is automatic.